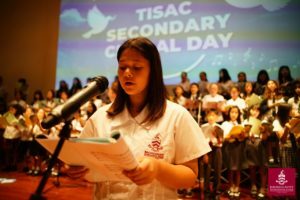 On Wednesday 26 September 2018, Bromsgrove International School hosted a very successful TISAC Secondary Choral Day, featuring 180 students from eight schools across Bangkok. During the morning, the students rehearsed in sectionals around the PAC, led by Music teachers from the visit schools. 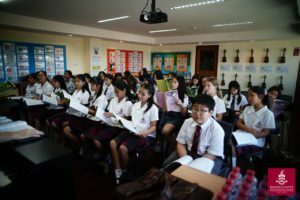 This gave the 70 Sopranos, 60 Altos and 50 Baritones the opportunity to warm up their voices, learn their separate parts and practice singing as a section of the choir. 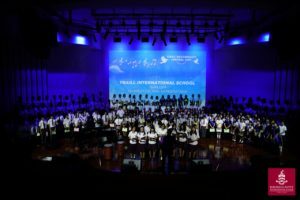 After a break, the three sections were brought together on stage in the auditorium to rehearse as a full choir, directed by Mr Meddows-Taylor and accompanied by Ms Alice. 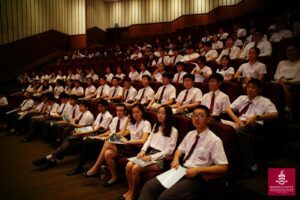 They worked through the four pieces of music, developing a range of choral ensemble skills, such as listening to each other, following a conductor and maintaining up to five individual parts at a time. 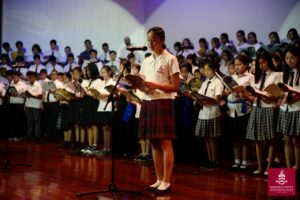 In the afternoon the full choir performed a gala concert for an audience of students, staff, parents and guests. They opened the concert with a beautiful rendition of the Royal Anthem of Thailand in three-part harmony. 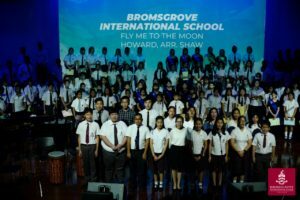 School choirs from Regent’s, Traill and Bromsgrove then took centre stage performing Shosholoza, Thriller and Fly Me To The Moon respectively. 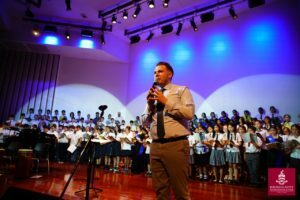 The final section of the concert featured the full choir, directed by Mr Meddows-Taylor, singing three songs chosen to celebrate the International Day of Peace on Friday 21 September. Firstly, John Lennon painted a picture of what it would be like to live in a world joined together in peace through a beautiful arrangement of his best-selling single, Imagine. The next song was an African-American spiritual called Peace Like A River, which uses water as a simile to describe peace, joy and love. The final song of the concert was based on the West African proverb: “It takes a whole village to raise our children”. Joan Szymko’s It Takes A Village embodies this proverb for choir, with the four vocal rhythms taking on their own character and function, creating the unique energy and movement of our “village” when brought together. All 180 students worked incredibly hard to out together this programme of music in just one day and should be very proud of this achievement and their performance. 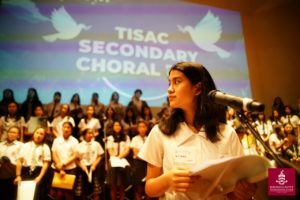 We would like to say a huge thank you to all of the Music teachers and Bromsgrove staff for organising and running this wonderfully enriching TISAC event.